2-keto-D-gluconic acid is found in the carrageenan polysaccharide of Irish moss and can be used as a stabilizer in the storage of biological materials. 2-keto-D-gluconic acid exhibits antimicrobial properties against species of Pseudomonas that cause plant disease. Genes for metabolism of 2-keto-d-gluconic acid are controlled by the UxuR regulon in E. coli. 2-keto-D-gluconic acid is converted to D-mannonate by the enzyme fructuronate reductase (EC 1.1.1.57). 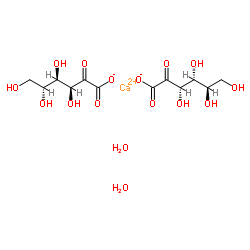 2-keto-D-gluconic acid hemicalcium salt can be used to make D-erythorbic acid using an α-amylase enzyme. It can also be used to prepare D-ribulose and D-arabinose by heating in pyridine with a nickel acetate catalyst.